This magnificent plant has become more popular over the last years and is now available as our Elderflower Flavour with its dulcet taste of honey and flowers. Our Elderflower concentrated flavour with its magical, sweet taste is one of many special flavourings. Fall in love with this natural, delicate taste. The Elderflower flavour is extremely concentrated and intended for further processing in the production of DIY e-liquids. Please read through the instruction of how to mix your own DIY liquid. 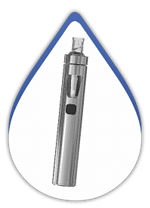 Do not vape undiluted flavourings – a flavourless vapour base is required. If you are unsure how much flavouring to add, you should start with a lower ratio. Have fun creating new, amazing e-liquids! 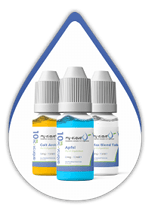 All flavors of my-eLiquid except tobacco flavors are flavors that are also used in the food industry. They are therefore harmless. In addition, all our flavours are free of colouring agents, sugar, lactose and gluten. Our employees are trained by TÜV Süd. Exclusive products in pharmacopoeia quality are used for the production of eLiquid flavours. In order to be able to offer you the highest quality and maximum safety when steaming, our raw materials are meticulously tested with every delivery. Despite first-class products at the highest level, we are able to maintain prices for our flavours in the mid-price segment. Due to our meticulous working methods and permanent raw material testing, quality is not just a slogan for us, but an experience. As the flavours are highly concentrated substances, they must not be used pure, but diluted with a base. The correct mixing ratio is 2% to 5% of the aroma in the base. Even if the proportion of aroma appears very low at first, it is absolutely sufficient for an optimal taste experience. Which dilution ratio is chosen depends on the aroma itself on the one hand and on the personal taste on the other. Sehr authentischer, intensiver Geschmack. Einfach nur lecker! Ich verwende es in einem Selbstwickler. Depending on the product, our flavours may contain the following substances. The flavors of my-eLiquid do not contain colorants. They are also free of sugar, lactose and gluten. Since our flavours are food flavours, you may also be allergic to the corresponding flavour if you have a food allergy. Keep the flavors out of the reach of children and animals. If accidental contact or ingestion occurs, rinse with plenty of water. If symptoms occur, seek medical attention with the product. Our flavourings are natural food flavourings except for tobacco flavourings. These are distributed by my-eLiquid online shop as flavours for eLiquids. Do not use the highly concentrated flavours pure. 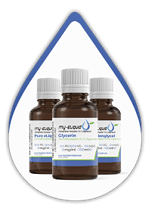 If you are allergic to propylene glycol, do not steam or choose a product containing polyethylene glycol. If you experience any allergic symptoms (shortness of breath, cough, skin rash, etc.) while steaming, discontinue consumption immediately. A medical clarification is useful. Keep the flavour in its original packaging in a cool and dry place. Observe the expiry date and do not use the product if there are visible physical changes such as turbidity, deposits or layer decay. I miss a flavor. Can I suggest a flavour? If you do not find what you are looking for in our wide range of flavours, please feel free to contact us and suggest a flavour. Can I steam the aroma pure? You can mix the aroma of your choice with a base yourself or buy a corresponding eLiquid with the desired taste. Flavours for the production of eLiquids must not be steamed pure under any circumstances and should always be mixed with a DIY-eLiquid base. Is nicotine present in the flavours? There is no nicotine in the flavours themselves. Bases mixed with the flavours are available with or without nicotine. Which aroma is right for me? We offer a variety of different flavors that can be mixed by yourself. Whether you want to create sweet eLiquids, fruity or tart flavours, you will find high-quality products from German production here. Most steamships try out many flavours and thus find their favourites. How do I best preserve the flavor? Be sure to keep the flavours out of the reach of children and animals. Store the product in a cool and dry place and avoid direct sunlight as it may cause changes such as loss of flavour. Do not use the flavors for food. Can I have an allergic reaction to the aroma if I have a food allergy? Apart from some tobacco flavourings only food flavourings are offered. If you suffer from a food allergy, you may also be allergic to the corresponding aroma. Allergies to carriers are also possible. In case of uncertainties, please consult an allergologist. Our Coke Flavour does not only taste as fantastic as the worldwide popular soda, it also has the same refreshing effect. Vape it and get immediate refreshment! Mix great liquids with the full-bodied, juicy fruit enjoyment of the golden delicacy: Our Honeydew Flavouring Concentrate will seduce you with its sweetness. Pure, intense and unadulterated: Our frosty Menthol Flavour gives you the 100 percent freshness of breath-taking, icy menthol - whenever and wherever you want! Fall into a Vanilla dream and enjoy the aromatic scent of the queen of spices that has left her unmistakably sweet and fragrant aroma in our Vanilla Flavour. Do you remember the pink, rolled-up chewing gum from your childhood? Its taste is now available in our My-Tide Flavour, combined with a gentle touch of menthol. Take a deep breath for irresistible freshness: Our bracing Ice Candy Flavour Concentrate refreshes you with the icy coolness of frosty glacial ice. Pure energy! When creamy buttermilk kisses zesty lemon aroma, our Bottermelk Fresh Flavour is born. This lovely blend gives you a delicious and refreshing vape experience. Always very popular, authentic in taste and deliciously aromatic: that’s our Strawberry Flavour Concentrate that imitates the taste of the red berry perfectly. What a magical combination! Let our wonderful Magic Purge Flavour Concentrate enchant you with its brilliant fusion of strawberries, blueberries and menthol. Haben Sie das Passende gefunden? Es ist völlig normal, dass ein Dampfer zunächst verschiedene Aromen ausprobiert bis er zu seiner persönlichen Favoritenliste gelangt. Hierfür bedarf es Ihrer Kreativität:mischen und kombinieren Sie verschiedene Aromen und Sie werden feststellen, dass Geschmäcker, die auf den ersten Blick nicht zusammenpassen, sich oft zu einer einzigartigen und faszinierenden Komposition verbinden. Sollten Sie das gewünschte Aroma nicht gefunden haben oder sich unsicher sein, beraten wir Sie gerne vor Ort in einer unserer beiden Shops in München.